Home / electric car charging station / electric cars / electronics / fuel cell vehicle / future technology / hydrogen vehicles / latest technology trends / technological advances / technology / Electric Power Generation from Fuel Cells - How do fuel cells work in hydrogen vehicles? Electric Power Generation from Fuel Cells - How do fuel cells work in hydrogen vehicles? Fuel cell car - Image from Wikimedia Commons. Fuel cells generate electricity to run the battery and engine by mixing hydrogen and oxygen into specially processed sheets that assemble to form the fuel cell stack. If you imagine the earth as a huge gas station, then its stock will end inevitably and there is a problem here. Many experts believe that our stocks of fossil fuels will end in the coming decades as we are going to reach the peak of oil consumption. If so, where will we get fuel? A quick solution is to find a way to increase fuel efficiency, improve our consumables and to increase the chances of recycling petroleum to use less fuel. A long-term solution can be switched from gasoline and diesel engines to electric fuel cells, which are just like hydrogen gas batteries. The electric fuel cell is one of the cleanest sources of energy which does not pollute the environment. In this article, we will let you know how electric fuel cells work and whether they are as much as we expect them from. Many international automakers have come up with innovative technology that will help fuel consumption better, especially after the discovery of hydrogen fuel cells that help achieve ideal rates at the consumption level. The cars operating in these cells are clearly going to be in fierce conflict with electric vehicles, with major manufacturers and even technology companies trying to produce environmentally friendly cars. Car experts say it will happen in the future if more stations are built to supply these vehicles with biofuels, especially as international car companies invest heavily in the technology. Fuel cells generate electricity to run the battery and engine by mixing hydrogen and oxygen into specially processed sheets that assemble to form the fuel cell stack. There are two ways to provide modern cars with power. Most cars use an internal combustion engine, which burns fuel, which in turn generates enough heat to push the piston up and down in a continuous process that drives the transmission and wheels, leading to the movement of the vehicle as a whole. Electric cars operate in a completely different way. Instead of internal combustion, they rely on batteries to provide the electric motor with the power needed to move the vehicle. There is also a type of vehicle called a hybrid car that combines both engines and switches together to suit driving conditions. Fuel cells are a junction between internal combustion engines and batteries. They release energy from the fuel in the storeroom, such as the engine. Unlike the engine, however, the fuel cell does not burn hydrogen but rather its reaction with oxygen from the air to make water. The electricity is produced in the battery that is used to run the engine of the car. The overproduction of this process is water and it is so pure that you can drink it. How do Fuel Cells Make Electricity from Hydrogen? In the fuel cells, the reaction occurs that is called "Electrochemical reaction". It refers to chemical because it is the process of fusion of two chemical elements and since it generates electricity when it occurs it is also an electrical reaction. The fuel cell consists of three basic parts similar to the battery components, which have a positive charge, shown in red, a negative charge in blue, and electrolyte (yellow). 1. The hydrogen gas passes through the tube to the positive electrode, and as the hydrogen is flammable and explosive, the reservoir must be strong and highly protected. 2. The cell gets oxygen from the air, passing through the second tube towards the negative pole. 3. The positive side is made of platinum. It is a precious metal that acts as a catalyst to accelerate the reaction in the fuel cell. When the hydrogen atoms reach the catalyst, they are divided into two parts: hydrogen ion (proton) and electrons. Since the hydrogen atom has a single proton and an electron. 4. Since the protons are positively charged, the electrolytes are connected to the negative electrode. The electrolyte consists of a thin layer of a special type of polymer that only protons can pass through. 5. At the same time, the electrons pass through the external circuit. 6. The engine is supplied with electricity when the electrons pass through it, and the process is required by the energy obtained, and the electrons eventually reach the negative side. 7. Electrons and protons accumulate at the negative pole with oxygen from the air and react chemically producing pure water, which comes out as water vapor. This type of the fuel cell is called Polymer/Proton Exchange Membrane (PEM). It differs in two ways: The letter P may symbolize Polymers or Protons (because it involves the transport of protons through the polymer membrane). As long as cells are supplied with oxygen and hydrogen, they will generate electricity. As oxygen is abundant in the air, the process is limited only to the amount of hydrogen in the tank. A single fuel cell can generate an amount of electricity equal to the amount produced by a dry battery, that is, it is not enough to operate a laptop, so how will it operate a car? 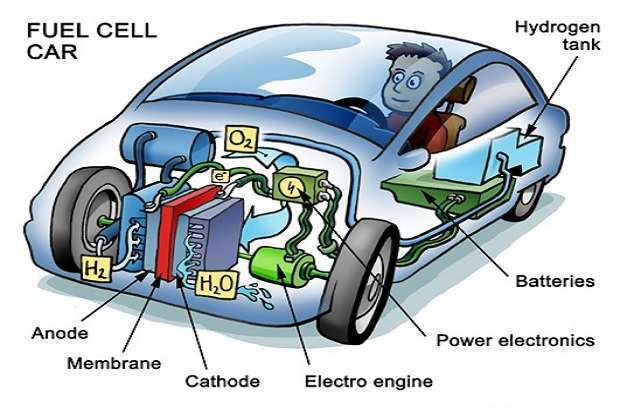 Therefore, fuel cells are designed for cars to be a stack of cells connected to each other like a chain. The total generated energy is equal to the number of cells multiplied by the energy generated by one cell. Currently, Proton Exchange Membrane (PEM) fuel cells are preferred by engineers to supply fuel but not the only existing design, as there are several types of batteries, each of which uses a different chemical reaction. There are several types of fuel cells as well. In spacecraft, a more primitive design called Alkaline Fuel Cell (AFC) is used, and greater energy can be generated using the design of Solid-Oxide Fuel Cells (SOFC). Microbial fuel cells are an organic method that has an additional characteristic: a store of bacteria is used to analyze sugar or another type of fuel to either generate an electric current or to give hydrogen. Another method can be used to place a solar panel on the surface of the car and the sun's water into hydrogen and oxygen by the electrolyzer. These gases accumulate in the fuel cell to generate electricity. Where Does Hydrogen Come From? Many people think that 150 years from now cars will work on hydrogen. In theory, hydrogen is the simplest and most abundant chemical element, accounting for nearly three-quarters of the universe's molecules. But if we look in the air around us, we will not find hydrogen. There is one liter per million liters of air, and that's where the problem lies. Where do we get hydrogen gas to supply the fleet of cars in the world? We will have to make it by ourselves from the water by separating it into its components to get hydrogen and oxygen through electrolyzer. An electrolyzer is an electrochemical tool that uses electricity and chemistry at the same time. The electrolyzer is divided into its constituent atoms by passing electricity through it. Electrolysis began in the eighteenth century when British chemist Sir Humphry Davy (1829-1778) used a primitive battery called Voltaic pile to detect a number of chemical elements, including sodium and potassium. In the battery: There are chemicals that dip the poles in a closed folder when the poles connected in a circuit. The chemicals react in the holster and give the voltage passing through the circuit. In the electrolytic analyzer: Put the solution in a folder and dip the poles and then connect to a battery or any power supplier passing electricity through the solution. Then the chemical reactions begin to separate the solution into its constituent atoms. If the solution is pure water, it is quickly divided into hydrogen gas (at the negative pole) and oxygen gas (at the positive pole). It is relatively easy to extract and store gases for future use. 1. The battery reaches the positive electrode with the cathode via the electrode. In the laboratory, it can be pure water, but in the real analyst, performance is greatly improved when using a solid polymer membrane that allows the electrodes to pass through it. 2. When operating, the water is divided into positive hydrogen ions and negative oxygen ions. 3. Hydrogen ions meet in the negative electrode and become hydrogen gas. 4. The oxygen ions are attracted to the positive electrode and are merged to give oxygen gas. People have been waiting for fuel cells since the 1960s when the Apollo spacecraft proved that the technology could be applied. Four decades later, it is rare to find fuel cell cars on the streets. This is due to several reasons: First, the world is going to produce millions of gasoline engines because it is cheaper, more tested and more reliable. You can buy a regular car at a good price, but not so long ago, fuel cell prices are hundreds of thousands more. Cost is not the only problem where gasoline engines support a giant oil-based economy: there are garages for petrol cars and petrol stations everywhere. Conversely, few people know about fuel cell vehicles and no hydrogen supply stations. That is, we are far from a hydrogen-based economic system. But we can see hydrogen fuel cars filling the world. There are many factories of electrical analyzers around the world that make hydrogen from water. As gases consume more space than liquid or steel, we need to keep them in a liquid state by exposing them to high pressure, making them easier to transport and preserve. They can then be transported to gas stations where people can fill their cars with hydrogen. Electric analyzer uses a lot of energy to produce hydrogen. We need electricity to separate the water. The efficiency of the solar cells that can be used to generate this energy will be about 10 percent. As the electric analyzer works at about 75 percent efficiency, the total efficiency is only 7.5 percent! In addition, to bring hydrogen to the car tank, we need the energy to transport it and compress it. Here we face a real problem because the energy density of the hydrogen is about one-fifth of the energy density of the gasoline. This means that we need five times as much gasoline as we need to cut the same distance. Likely since a gasoline car needs heavy engines and transformers. Hydrogen also leaks out of most of the portfolios because of its small particles, so storing it for longer periods is harder. The other problem is that it is flammable, and any leakage may lead to appalling explosions. Hydrogen itself is not fuel but a way of transporting fuel that is made by another process. So we find it closer to the battery than gasoline. Hydrogen cars look promising but if the batteries are better then hydrogen will be a costly deviation from the trend of business in the world to shift from fossil fuels to renewable energy, such as hydrogen. Some believe Hydrogen has several advantages over electric power technology. The battery requires a half hour to all night until shipped while you can fill a hydrogen car in just a few minutes. The distances that can be cut are also controversial. Current cars claim they can travel hundreds of kilometers between charging and the other, but that depends on how much energy is consumed on other objects while driving and reduces the distances it takes as the battery advances in age. On the contrary, fuel cell vehicles maintain distances as regular vehicle interviews, although their performance decreases with increased use time. Battery technology works best in small cars, while fuel cells perform in cars and trucks. This comparison is constantly changing as both competing technologies - hydrogen fuel cells and rechargeable batteries. The companies will only become fuel cells when oil prices increase, and a fossil fuel car ride becomes costly and economically inefficient. Even then it will face competing for technology that may precede fuel cells, where we can continue to use internal combustion engines but using biofuels or electric cars are more efficient with batteries that can be shipped from home. Oil reserves will extend until new technology emerges, just like nuclear-powered cars! No one knows what the future holds, but it is certain that the role of oil will be less so we will have to rely on alternatives (electric cars, biofuels, fuel cells, etc. ).